Support for the VBA editor of Office 64-bit. You can read about all the features and details on the online help. During October 2015, the prices is 50% off: just 39.95 USD instead of 79.95 USD. 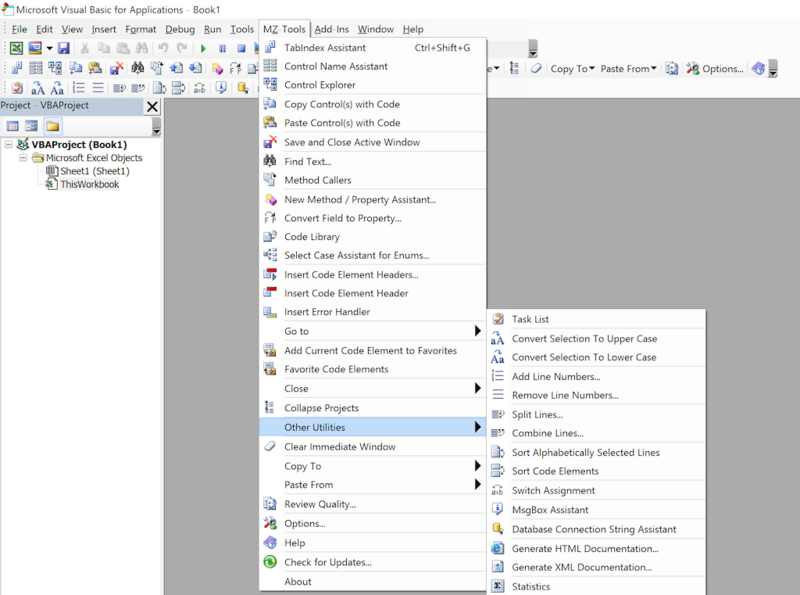 A single license of MZ-Tools 8.0 is valid for all your IDEs (Visual Studio, VBA, VB6, VB5) and can be installed on all your computers. This version works on any Windows operating system (from Windows XP to Windows 10), either 64-bit or 32-bit, and for the VBA version you can use from Office 2016 back to Office 2003. If you are interested in the technical details, it internally uses .NET Framework 2.0 (so chances are that your computer already has this requirement) and all versions for all IDEs share 80% of code at binary level (a single dll with all the features, the remaining 20% code being “adapters” for each IDE), which means that in the future any new feature or enhancement will be included in all of them. You can download a 30-day, no-limitations, trial version here.